"Just super! Very spiritual. (Daniel) Exceeded expectations." The joy of the Holy Land is in the feeling that comes from remembering the events that took place here. Great events were caused by humble prophets, and men wanting to be great were caused to be humble. This land was chosen by God to be the place for the revelation of truth. 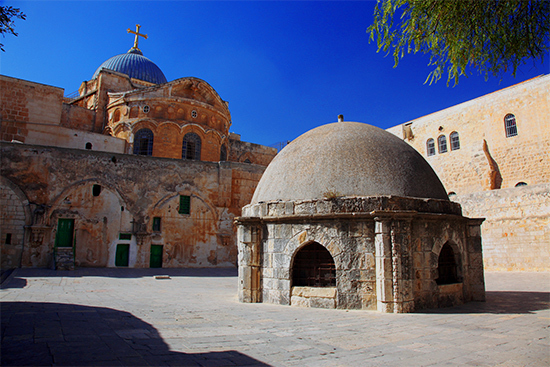 Abraham was sent here to establish the true worship of God. A religion and culture developed that would be spread to the surrounding lands and peoples, and thus Israel became the spiritual and temporal crossroads of the East. It is remarkable that such a little land had such a great effect on history. Discover the Red-Rose City "half as old as time! One of the "greatest experiences of your life" commences with your flight connecting into Tel-Aviv (Israel). Did “Good” Samaritan mean “Bad” Jew? Where do Dead Sea Scrolls come alive? "The Living Desert" from the Israel Revealed video series by Daniel Rona. Buy the full DVD set now. The Savior told a story of a Levite and a Priest, and of a Samaritan (who ended up extending himself past his ethnic identity, saving a life). With hope of higher life, the Essenes, consecrating their wealth, migrated to the Dead Sea wilderness. Learning of temples where the sacrifice of a lamb symbolizes the sacrifice of One bringing new life. Today, as the land is being redeemed, ethnic identities and border lines are being extended in hope of peace. What does it take to “walk on water?” More about Jesus in Galilee. "The Galilee" from the Israel Revealed video series by Daniel Rona. The Savior, at the Headwaters of the Jordan River, asked, “Whom do men say that I am?” . . . here he named Simon “Rocky” (Peter). The same water turning the millstones, grinding and producing bread, maintained life. The ‘Fountain of Living Waters”, bearing the weight of our millstones, gives us life. In Capernaum, where He performed most of his miracles, we learn of Jesus relieving the millstone of death, healing a family as “Talitha” arose. The Sea of Galilee, continuing to provide Israel with water, maintains life in the land. On the same water, the sinking Peter (Rock), crying “Lord save me,” learns that the “Rock of Salvation” came to save. On the Mount of Beatitudes, opening eyes, ears and heart, the Savior taught “Come unto me,” promising the Healing Spirit. How to “get stoned?” The real story of Nazareth and Caesarea. "The Way of the Sea" from the Israel Revealed video series by Daniel Rona. The Savior, “passing through the midst of them”, taught us to walk in his light. A modern city rising on a dew-endowed Mount Carmel, becomes the resting place of Mormons and Bahais. Learn how the feelings of brotherhood can replace persecution. Jonah, avoiding the call to teach Gentiles, by escaping to Jaffa, sinks to new heights as the Lord brings him up from the depths of the sea. Terraces, olive trees and unfinished watchtowers used to maintain peace, remind us that all roads lead “Up to Jerusalem,” beckoning us to gather to the Mountain of the Lord to find “Shalom” - peace. Was it "Temple Square" or a building? Moslem claims to the Temple Mount? "Jerusalem's Holy Places" from the Israel Revealed video series by Daniel Rona. In the Israel Museum, ancient temple artifacts reflect the timeless eternity of worship practices. The Essenes’ Dead Sea Scrolls reveal a redesigned temple that includes the entire city of Jerusalem. Although they had an understanding of the signs of the seasons, they failed to recognize the Lord and the signs of his times. A view of a miniature city of 2000-years ago, revealing Jerusalem’s major impact on the world, also reminds us that from the City of Peace (Shalom) came His peace. Samson, from Bet Shemesh, a judge in Israel, misused his God-given strength. In crushing the Philistines, he worshiped himself. David’s childlike faith in the Lord brought down a giant with a sling and a stone. How would it feel to "Walk Today Where Jesus Walked?" "Jerusalem at Worship" from the Israel Revealed video series by Daniel Rona. The Savior’s atonement (obscured by arguments over ownership of a Sepulcher) manifests itself in the rebuilding of Jerusalem. Destroyed by fire in the first century, the preserved and rebuilt ruins of the Holy City remind us of promised redemption. One discovers temple-like clothing and ritual celebration at the Western (Wailing) Wall. Ancient money changers, who assisted people with temple worship, are remembered as one steps where Jesus walked. Where are the "Three Days and Three Nights" in the scriptures? "The Footsteps of Jesus" from the Israel Revealed video series by Daniel Rona. Bethlehem hillsides with sheep and shepherds overshadow churches’ disputations of ownership of Jesus’ traditional birthplace. The loneliness, obscurity and difficulty of His birth are sweetly replaced with songs of Herald Angels. The Savior brought Lazarus out of a grave, causing a Bethany family to be reunited, helping us understand that families can be together forever! The symbolism of Passover rituals set the stage for understanding the Last Supper and the sacrament. The Mount of Olives, place of the Red heifer sacrifices, is where the Savior’s blood-stained atoning sacrifice occurred. He will return to this mount in red clothing. Walking ancient steps to Caiphas’ and Pontius Pilate’s palaces, reminds us of the mocking trials He endured. Remembering the reason He came, visualizing along the roadway, a visible place of execution. Close by, a Jewish Garden Tomb of the first century is empty, quietly reminding us that He lives. He suffered, died, and came alive again, preparing the way for us to be together with Him and our Father in Heaven. How did the LDS Sabbath come to be on Saturday in Israel? With the re-establishment of the Jerusalem Branch in the Latter-days, the Brethren established Church approval for Saturday observance of the Sabbath in Israel. With respect for the “cultural and religious identity of the people of Israel,” LDS church members are welcome to attend LDS Sabbath Services with the Jerusalem Branch. The afternoon is at leisure, perhaps for venturing on one’s own into the Old City & walking atop its walls! How did the Mt. of Transfiguration become the highest spot on the face of the Earth? "Transfiguration" from the Israel Revealed video series by Daniel Rona. At the lowest spot on the face of the Earth, where living waters still flows, the Savior descended below them all. Simple followers, who save, are honored by one who has the higher glory. The Savior, coming to be immersed, is tempted by wealth. Today we say SHALOM (the traditional 'hello' and 'goodbye' in Israel means PEACE). "May peace be with you," and your family & friends always, as your Holy Land experience continues giving you eternal memories of the land, the people and the scriptures. For most, your airport shuttle transfers you to the Tel-Aviv airport for your scheduled Flight. Optional Additional Programs, transfer to a Jordan River Crossing. Daniel and Steven Rona speak quietly through high-quality head microphones and mix soft music accompaniment with their scriptural renditions, also providing you with reverent background music in times of quiet contemplation... The artists and orchestral background music include, Piano Artistry - Marvin Goldstein, Famed Movie Theme Composer - Lex DeAzevedo, Acclaimed Acoustic Guitar - Michael Dowdle, Angelic Singer - Sarah Morgann, Inspiring Janice Kapp Parry, and Beloved Lyricist/ Performer - Michael McLean. In a typical 10-11 day tour you be treated to more than 100 renditions, more than 350 minutes and almost 6 hours of inspiring music! Israel's landscapes are as varied as her people, with ocean and seas, plains and mountains. It is green, and there is water! It is a good land, where Jews, Moslems, and Christians raise their families. A feeling of peace and youthful growth exists even though its history is almost as old as civilization - a country more than 50 years old, going on to five thousand years old and conquered close to 30 times. The conquerors have included (alphabetically), Arabs, Assyrians, Babylonians, Canaanites, Crusaders, Egyptians, French, Greeks, Hyksos, Hittites, Israelites, Jebusites, Mamelukes, Meads, Persians, Philistines, Romans, Syrians, and Turks. The people that continue to live in this land are the remaining Jews and the Arabs.